As Marijuana Refugees Flock to Colorado, Will Medical Community Force Rewriting of U.S. Drug Laws? | Democracy Now! founder of the Clinicians’ Institute for Cannabis Medicine, and owner and founder of Gedde Whole Health in Colorado Springs. moved to Colorado last October to seek treatment for her daughter, Madeleine, who has epilepsy. AMY GOODMAN: —because we have your video about Charlotte. In this video produced by the group Realm of Caring, Paige Figi recalls how her daughter Charlotte suffered from relentless seizures. PAIGE FIGI: So, Charlotte has Dravet syndrome. It’s a severe pediatric epilepsy. The seizures, when they start with Dravet, are status. They don’t stop on their own. So they’re 20 minutes or 30 minutes or longer. I think her first one was about a half hour. Every seizure after that for two-and-a-half years was a status seizure, and some are four hours long, two hours long. And, you know, at that point, she’s intubated in the ER, in the pediatric ICU. And medicine doesn’t stop them. So that’s—we went through that for about two-and-a-half years. We got diagnosed at two-and-a-half years old. A few times, her heart has stopped during these—using these drugs. And I’ve done CPR on her. And a couple of those times, you know, I just sort of let go of the fact that—just to keep trying with her, and I said my goodbyes to her and, as I’m doing CPR on her or in the hospital, kind of prepared myself for the worst. And she’s still here, but she’s been through a lot to get to this point. The doctor, you know, she heard her history of seizures at that time and said, “We have to pull her last med that she was on.” Her exact words: “We have reached the end of the line with medical options for Charlotte. And I don’t know what to tell you. There’s really nothing else we can do.” And that’s when we met the Stanleys, and that’s when we got started on the CBD, after six months of I really didn’t think she would survive the seizures, at 300 seizures a week, roughly, of, you know, grand mal, tonic-clonic seizures a week. Just to put in light what 300 a week is, it’s about four an hour. It’s one seizure every 15 minutes. So, you know, sometimes it was every five minutes. It just never stopped. And so, to see her seizure-free for a whole week, for seven days—she went seven days, instantly. And we’ve been on it nine months, and from that 300 seizures a week, she now has zero to one tonic-clonic a week. And so, it’s greater than 99 percent seizure reduction. And it’s amazing. It’s just absolutely amazing. To think that she wasn’t going to survive, and look at her now: She has a life. During that time, she lost the ability to walk, talk, eat and really just, you know, participate in life at all. She couldn’t do anything. She just sort of lied in my arms catatonic, and I thought that was it. There just wasn’t a life for a person. But here we are. AMY GOODMAN: That’s Paige Figi talking about her daughter Charlotte. Dave Philipps, the Pulitzer Prize-winning reporter, you did the piece about her in the Colorado Springs Gazette. Take it from there. DAVE PHILIPPS: Well, families all over the country—this essentially spread on Facebook. Families like Dara’s family, and there are thousands and thousands of families that are in similar situations, where the medical establishment has thrown everything at their children’s seizures and nothing has worked. And so, they really had no choice but to, if they could, come to Colorado. You know, one of the things that I think people hear is, when they hear, like, “Oh, people are treating their kids with cannabis,” they think it’s some hippy nonsense or something. And what they don’t understand is that these parents had no choice. It was either try this or let your children die. And so, you know, they came. What else could they do? JUAN GONZÁLEZ: Well, we’re also joined by Dr. Margaret Gedde. She worked with several of the families we have been focusing on here. Dr. Margaret Gedde, welcome to Democracy Now! DR. MARGARET GEDDE: Thank you. JUAN GONZÁLEZ: Could you tell us how you first got involved in the treatment, in the use of medical marijuana? DR. MARGARET GEDDE: Certainly. Let me just give a little bit of background. My original training in medicine is in pathology and research. I did my Ph.D. as well as my M.D. in chemistry. I did that at Stanford University. I did many years of research, and then I started to work in the pharmaceutical industry developing medications. And it was about 10 years ago that I had a realization that the drugs so often chosen for development in the pharmaceutical industry are chosen, of course, to make a profit and not necessarily because that’s what people need. And I—then I also realized there many therapies that already exist that are more supportive and less toxic than pharmaceuticals, that that can have tremendous benefit, but most doctors don’t know about. So, this was before I learned at all about cannabis. I did open an alternative medical practice about 10 years ago and have been seeing patients to give them supportive, holistic therapies. It was four years ago, when this all came up in Colorado, going on five years ago, that I first started to hear that marijuana could be medicine. I was encouraged to see a few patients in my practice to do the recommendations, as they are called in Colorado. And then I started hearing from my patients all this—a list of things that marijuana seemed to help them with. And I started to ask: How can this do so many things for people and not be toxic, because it has such a safe profile, again, compared to so many pharmaceuticals? That’s when I learned about the endocannabinoid system, which is simply that we have our own human cannabinoids. We make our own cannabinoids in our bodies, and this system is very important in regulating other body systems. So when I kind of got onto that—it was about four years ago—then I decided to completely focus my practice on medical marijuana, on medical cannibis. It was about two years after that, two years ago, that I first met Charlotte Figi, and we started seeing children for the seizure disorders—again, not really knowing what effect that would have, but just continuing to pursue this possibility for these families. JUAN GONZÁLEZ: And in terms of the success rate of the treatments with the families that you’ve already dealt with, could you talk about that? DR. MARGARET GEDDE: Certainly, yes, and we’ve seen now in clinic over 200 children specifically for this. Not all of them have been able to—200. Not all of them have been able to start the oil yet, so we don’t have follow-up results on everyone. But what does happen is, you have to be careful how you use the oil. It’s easy to get overloaded. We’re finding that low doses are often more effective than high doses. There can be bumps in the road. But I would say that about a quarter of the children get results like Charlotte did, where they’ll get that 80 percent or more seizure reduction. Another 50 percent get definite positive results, including the behavioral and cognitive improvements that Dara was talking about, in addition to some seizure control. So there can be some mixed results, but definitely positive benefit. There are—there is a percent of kids who have a lot of trouble adding the oil in any amount, and we continue to work with them to find combinations and doses that will work. So the majority do get some definite positive benefit, although not every child does, for sure. And we’re continuing to learn the proper ways to dose this and how to understand what combinations are going to work for each child. AMY GOODMAN: We’re speaking to Dr. Margaret Gedde in Colorado Springs by Democracy Now! video stream. She runs Clinicians’ Institute for Cannabis Medicine. Dave Philipps, talk about the legality of all of this, how things have changed in Colorado, and how many states would allow this. DAVE PHILIPPS: Well, there’s something really interesting that’s happened. Colorado has had a medical marijuana law on the books for about 14 years, and it has allowed this to happen, even though no one who wrote the law thought maybe some day this could help really sick kids. It has. But what’s interesting is that when people like Dara come here and they have success, they know a ton of families in a similar situation back in whatever state they’ve come from. And at this point, we have families here from almost every state. And so, what happens is they create this ready-made lobbying group of both a success story and people at home that want to push for the same opportunity. And they have started, in the last four or five months in almost every state, going to their state legislatures and saying, “We want the same chance. Let us save our children.” And so, there’s 20 states, and states that you wouldn’t think would have this legislation, that this spring have introduced it. States like Alabama, Mississippi have both passed laws allowing this to happen. Kentucky, Utah, some of the reddest states in the country, are passing medical marijuana laws that are very narrowly defined to help these kinds of kids. And so, I think there’s sort of this sudden realization that there is real therapeutic qualities in marijuana and that it’s not just some recreational subterfuge. JUAN GONZÁLEZ: And, Dave, what’s the difference between the marijuana that people smoke for recreational purposes and the oil that the children are being administered? DAVE PHILIPPS: You heard Dr. Gedde talk about cannabinoids. And in cannabis, there are several different kinds. The one that gets smokers high is THC. The one that is really plentiful in the oil the kids use is something called CBD, or cannabidiol. And basically, from my understanding, it acts as sort of a neuroregulator, something that keeps brain signals sort of calm and steady. So, it has absolutely no psychoactive effects. You could drink a whole bottle of it, and it wouldn’t get you high. But it does have this very powerful effect on regulating brain signals. AMY GOODMAN: We’re going to go to break and then come back to this conversation. We are with Dave Philipps in Denver. He is actually based in Colorado at the Colorado Springs Gazette and just won a Pulitzer Prize. Dara Lightle, also with us, she—we just spoke with her and her daughter, Maddy. She has come to Colorado from Virginia because it’s in Colorado that she can get the drug to treat Maddy’s epilepsy. And Dr. Margaret Gedde is with us from Colorado Springs. She runs the Clinicians’ Institute for Cannabis Medicine. And we want to ask Dr. Gedde, when we come back, about doctors calling her from around the country now. We’re hearing that young people and parents are pushing for this kind of legislation in other states. What about doctors? Stay with us. JUAN GONZÁLEZ: As we continue our talk about marijuana refugees and medical cannabis, I want to turn to a video featuring Heather Jackson talking about her son who once suffered 200 seizures a day. This video was produced by Realm of [Caring]. HEATHER JACKSON: Zaki has a rare, catastrophic epilepsy diagnosis called Doose syndrome. What that entails is lots of seizures every single day, delayed development, autistic tendencies, those—that sort of thing. In the end, we had tried every medication that’s indicated, 17 treatments in all, plus the ketogenic diet, which is a special diet for epilepsy. So we really tried everything that we could. Really, none of them helped, or they would make his seizures worse. And then the side effects from the medications, of course, are ridiculous. I pulled out some scrapbooks so you can see what Zaki looked like on steroids. He doubled his weight. He was having—the EEG showed—EEG is just an electrical scan of the brain waves, and it shows the seizure activity. And he was having 200-plus seizures an hour. And so there are, you know, eight people in his room watching him seize over and over. We were there about a week. They just confirmed the diagnosis and said there was nothing else they could do. And we were there to get the confirmation of what we were really dealing with, but to get help, for them to help us. Again, you know, they said they’ve really tried everything in their bag of tricks that they had. Really, not to be melodramatic, but you’re in really the fight for your child’s life. We finally made the decision, yes, we need to do this. We need to go ahead and get his Red Card, start this whole process. We were at the end of, you know, our pharmaceutical rope, so to speak. And just the safety profile was just unheard of. I mean, I knew that I wasn’t going to kill him giving him too much, which I couldn’t say for any other medication that we’ve tried. At Zaki’s worst, he had 200 seizures an hour. And it has been 106 days now since his last seizure. I get to say, after almost a decade, I get to meet him, for the first time, without all this seizure activity. We had drugs. If you can imagine waiting 10 years to meet your kid. It’s real. It’s absolutely real. I don’t even have the words—I don’t have the words to describe it. JUAN GONZÁLEZ: That was Heather Jackson talking about her son who once suffered 200 seizures a day. Dr. Margaret Gedde joins us again. She’s from the Clinicians’ Institute for Cannabis Medicine, that she founded. She also treated this family, as well. Dr. Gedde, I wanted to ask you, the American Academy of Pediatrics is critical of the use of therapeutic marijuana for children, because it claims it has not been tested or approved by the Federal Drug Administration. Your response? And maybe you could talk about this other family that you also treated? DR. MARGARET GEDDE: Yes. So the state of research around marijuana, cannabis, is that because it is a Schedule I controlled substance by the federal government, stating that it’s highly dangerous with no medical use, it is essentially impossible to do the proper clinical trials. So we’re in a catch-22 where people say you don’t have the studies, but then you can’t do the studies. Now, there is a long track record, of course, of human use, actually thousands of years, not specifically in pediatric seizures, but also there are studies coming from other countries, and there is a large body of animal and laboratory work supporting the clinical trials that could go on. So it absolutely is the case that the trials are not there yet that we need. On the other hand, we have a lot of information about this medication, and we know that its safety profile is much better, it’s much safer, just with what we know about it, than so many medications that are already in use. So it’s correct that the establishment has this issue where the proper things aren’t in place. As physicians looking to benefit patients, however, if you can look at the risk and benefit for each patient, when you look at the condition the child is in and the fact that death is a real possibility for many of them, and then what is known about the cannabis safety profile, even though we don’t have that solid research underpinning yet, as physicians treating a particular patient, definitely, I think that you can make a very strong case that the patient and the doctor, together, should be able to look at all the possible treatments and choose cannabis as something to try, because—call it a therapeutic trial. It doesn’t mean they’re committed to using it forever. But I—even though we don’t have the studies, I think that, again, doctors and patients are well within the very good and ethical practice of medicine to consider this as an option for a particular person. AMY GOODMAN: This is Dr. Sharon Levy, who is a critic of medical marijuana, of Boston’s Children’s Hospital. She is chair of the American Academy of Pediatrics. DR. SHARON LEVY: Using marijuana as a medication is jumping the gun, because we really don’t know what the side effects and long-term consequences of marijuana are on particularly children. I worry that we just don’t know enough about it. A couple of generations ago, people were recommending tobacco. Even physicians were recommending tobacco as a good method of relaxation or to relieve stress. It seems unbelievable now. AMY GOODMAN: And this is one of the nation’s most prominent doctors announcing he’s shifted his stance in support of medical marijuana, Dr. Sanjay Gupta, the chief medical correspondent for CNN, openly apologizing for his past reporting dismissing the medical uses of marijuana. AMY GOODMAN: We’re going to go to that clip in just a moment. Dr. Sanjay Gupta, again, coming out—he was long against the issue of cannabis medicine and the use of medical marijuana and then came out in favor of marijuana. Let’s go to Dr. Gupta. DR. SANJAY GUPTA: I have apologized for some of the earlier reporting, because I think, you know, we’ve been terribly and systematically misled in this country for some time. And I—I was—I did part of that misleading. I didn’t look far enough. I didn’t look deep enough. I didn’t look at labs in other countries that are doing some incredible research. I didn’t listen to the chorus of patients who said, “Not only does marijuana work for me, it’s the only thing that works for me.” I took the DEA at their word when they said it is a Schedule I substance and has no medical applications. There was no scientific basis for them to say that. AMY GOODMAN: Dara Lightle, as you hear the experts speak, your thoughts? DARA LIGHTLE: Well, it rings true, because I used to believe the same stuff. I believed what society was telling me, what the doctors told me and what the federal government was saying. And I thought when people were saying that—put my daughter on medical cannabis, I laughed at them. And then when I saw the video of how it was changing people with seizures, and now living in Colorado and seeing multiple patients’, not just seizure patients’, lives being changed and healed due to this plant, I’m baffled that I believed those things, that the world believes those things. That the federal government has it as a Schedule I drug is ridiculous; that we’re so scared of THC, that even talking about Charlotte’s Web and seizures, that we’re nervous to say, you know, that there may be some THC, and they might get a feeling of high, when they’ve been on these pharmaceuticals that have addictive properties to it, where adults are losing their lives and becoming homeless on these medications that my eight-year-old was on, and we’re worried that if they get a little bit of THC they might get a little bit high. Well, some of these patients do need THC, and it is benefiting them. And if they’re going to get a little bit high off of it, that’s not necessarily harmful if it’s helping them and healing them from the things that they’re dealing with medically. JUAN GONZÁLEZ: And, Dave Philipps of the Colorado Springs Gazette, as you’ve been reporting, it’s not just people in the United States that are beginning to come to Colorado. People from all around the world are hearing about this and are beginning to say, “Well, maybe this treatment can work for my child, as well.” Could you talk about the spread of the word? DAVE PHILIPPS: Well, these stories are so powerful—I mean, you’ve just seen them—that families in similar situations will do whatever they can to attempt the same healing. I wouldn’t be surprised, you know, if the evidence continues and the word spreads, that this could very easily change federal law, change laws in other countries, really be a kickstarter for the scientific research that is lacking, and, you know, five years from now we will look back on this as being almost medieval, and that we will have a much larger understanding of the potential. AMY GOODMAN: Dave, can you talk about where the laws have changed as a result of what’s happening now in Colorado? DAVE PHILIPPS: Yeah. So, really, the word of this only started spreading late last summer. And we started reporting on it through the fall and into the winter. At that point, families in other states that were in similar situations, but have no access to the marijuana oil, started pushing for change. The first one to change their laws was Utah, which is a very, very conservative state and had never even come close to passing a marijuana—medical marijuana law. What they did is they have a very specifically tailored law that allows only for marijuana oil with a low amount of THC, so that there’s no potential for abuse. And I think, to some extent, other states said, “Well, look, if Utah passed this, let’s give it a look.” This is not Colorado-style medical marijuana where you have dispensaries on every corner. And so, you know, very quickly, states throughout the lower Midwest, the Deep South started having these similar types of laws. And people from Colorado were very instrumental in this. Families traveled to push for it in their home states. Paige Figi, who you just saw, along with the Stanley brothers, have been in—spoken in legislatures across the country, saying, “Look, this is real. This is not harmful. This is not dangerous. Give it a chance.” And so now big states like Florida are on the cusp of passing this law. And I think 20 other states have passed it. AMY GOODMAN: And talk about how this fits into—for people who are not aware of what has happened in Colorado, overall. I mean, the marijuana oil, the cannabis oil, is not the same as smoking a joint. Maybe you can talk more about the difference. But, in fact, it’s not illegal to smoke one in Colorado. 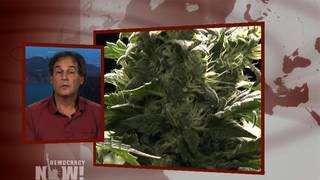 Talk about the overall effect of the change of the law in Colorado and also how it’s affected the economy. Then Colorado went one step further, and this year we legalized recreational marijuana, which is funny because the national press made a big deal of it, but it was really not a big deal here because we’ve had medical marijuana stores, essentially, all over the state for years. And so, now the fact that you can go in without having to have a state-mandated card is not a big change. And I think Coloradans don’t even really notice it. How has it affected the economy? Well, things that were in the black market are now out in the open, which means they can be regulated and taxed. I don’t think that there are many people who see that as a bad thing. JUAN GONZÁLEZ: And, Dara Lightle, what about the cost of this treatment? Given the fact that this is still a Schedule I drug, insurance companies don’t reimburse. For families that may be of low income, what is this costing you? DARA LIGHTLE: It usually depends on weight, is what they—how much oil you take. My daughter, it currently costs about $450 a month. She’s on two forms, two different properties of the cannabis plant oil currently. She started with Charlotte’s Web, and we did add THCA. It’s a raw form of THC, also doesn’t have psychoactive properties. But she’s on both of those currently, and it’s about $450 a month. Now, for an adult, it could be up to $900 to $1,000 a month. AMY GOODMAN: And, Dave Philipps, what happens then? DAVE PHILIPPS: Well, there are people—I’ve spoken to them—who can’t afford this, especially people who have grown-up kids or are young adults. Like she said, they’re heavier, so they need more of the drug. Now, they can get barbiturates, all sorts of drugs that are ineffectual, covered by Medicare or health insurance, but there’s no funding to help cover the cost of this oil which is drastically improving their lives. And I’ve spoken to people who just can’t swing it. They don’t—literally, the money is not there, and they’ve given up the treatment. AMY GOODMAN: And finally, Dr. Margaret Gedde, doctors contacting you from major medical institutions around the country, including in states like Virginia, where Dara is from, where it’s not legal to use this? DR. MARGARET GEDDE: I mostly hear about physicians through the patients. Actually, at this point, I haven’t had doctors at major medical centers reaching out to me. Those are the types of connections we are building. It’s interesting because, as a medical cannabis physician, I’m kind of on the other side of the divide, which—with that Schedule I designation in the middle. And doctors in institutions, you know, that of course take federal funds in terms of Medicare and Medicaid and on so many different things, there is this division where really it kind of limits them in terms of being able to discuss this with their patients. They’re really restricted by the insurance companies and many other things. AMY GOODMAN: Dr. Margaret Gedde, we’re going to have to leave it there, but we’ll continue to follow the story. Dr. Margaret Gedde, founder of the Clinicians’ Institute for Cannabis Medicine, owner and founder of Gedde Whole Health in Colorado Springs. And thanks so much to Dara, Dara Lightle, for bringing in your daughter, Maddy, and sharing your story. And to Dave Philipps, congratulations for your Pulitzer Prize, which you’ve just won. Dave Philipps is an investigative reporter with the Colorado Springs Gazette. We’ll link to his latest stories there. We have a job opening at Democracy Now!, hiring three part-time video news production fellows. Candidates should have video shooting and editing experience. Visit democracynow.org for details.